I am super happy to announce that I will teach a painting workshop in Paris next May. It will be a new milestone to achieve. You may have seen that I did so many landscape paintings this year. Within the landscape genre, my true love is cityscape. So I am so looking forward to this trip. If you like to paint building as well, please travel with me. We will have a wonderful painting trip together. 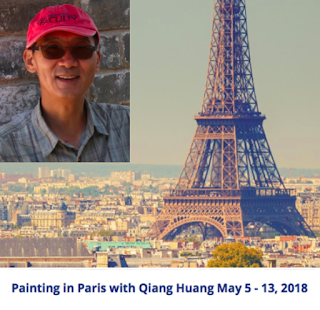 For detailed information, Please check: http://www.1worldarttravel.com/paris-with-qiang-huang.html. "Demo at Florence TX 2017 3"
"Demo at Florence TX 2017 2"
"Demo at Florence TX 2017 1"
"Demo at Hinckley 2017 3"
"Demo at Hinckley 2017 2"